A friend asked me to write a post about HOW to go vegan and I thought it was a great suggestion, so here is my advice. A lot of these come down to slowly changing habits and educating yourself. Don’t get overwhelmed. There is no such thing as the vegan police and you don’t have to make the switch all in one day. In fact, I wouldn’t recommend making the switch all at once. On the day I saw the documentary, Forks Over Knives on Netflix, I knew that I was going to do this and from that day on, I didn’t buy any animal products. I did however, look at the yogurt and cheese in my fridge and decided not to throw it out. It took me a month to get through everything non-vegan in my fridge and cupboards. You may want to make a slower transition. Maybe start out small like one new recipe every weekend, but make something that you can double and have it for lunches during the week as well. Remember this is also not an all-or-nothing. If you just eat vegan 3 days a week, you are doing your health, the environment and the animals a lot of good. Certainly 7 is better, but don’t give up and go down to zero just because you don’t have anything in the fridge one day and want to give up. Think of it as adding new foods into your diet instead of taking foods out. This was absolutely the best piece of advice that I got. When I was 17, I tried to go vegan and I failed after 2 weeks. For one thing, I was surrounded by processed foods. When I looked in my parents’ cupboards and looked at labels, I kept putting things back. The only thing I was left with was peanut butter and saltines, so I just kept eating that. I tried to do an internet search on veganism but wasn’t able to find much because this was 1999. Why it never occurred to me to make a vegetable stir fry, I have no idea. I wish that I had had a friend who could have recommended a book or given me some advice. We are so lucky today to have so many resources! Back to the point about not doing this all in one day, you can just slowly add new foods to your diet until you wake up one morning and realize that you have no desire for any dairy, eggs or meat because you already have your weekly routine down. Try adding a morning smoothie. Take some nuts to work to have with you for a mid-morning snack. They’re great for making you feel full and have lots of protein and vitamins. Cook! I bought the cookbook Quick Fix Vegan when I first switched and I got cooking. The recipes were so delicious that I just kept making more. You’ll start to find your favorite recipes that you want to start making again and again. Since I’m usually cooking for one or two people, I tend to cook large pots of soups and then I eat one bowl, put one bowl in the fridge for lunch or dinner later in the week and then I put the rest in the freezer for the next week so I’m not eating the same thing all week long because that gets real old real fast. Sunday seems to work out the best for me as a cooking day. In the morning, I find one or two new recipes I want to try and I write down the old faithfuls that I want to make again. Then I go to the grocery store to get all of the items I don’t have and I cook for maybe 3 hours. This sounds like a lot, but sometimes it’s the majority of what I cook in the week, since after that it’s just reheating. Your salad has to be hearty enough that you feel full afterward. 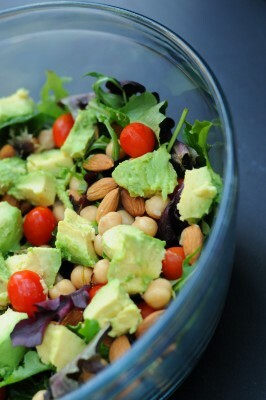 Try adding some avocado, beans and nuts. Eat more! 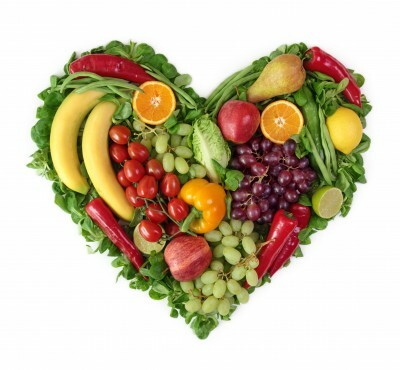 Vegetables have significantly fewer calories than meat or dairy. The people who say veggies don’t fill them up just don’t eat enough. One cup of broccoli has 31 calories. Eat two cups! The whole calories-in-calories-out thing is a myth. A calorie is a unit of measurement describing how something burns. I heard that there are 31 million calories in a gallon of gasoline. Do you think you would gain 8,857 pounds if you drank a gallon of gasoline? Of course not, you would die, so I don’t recommend it. Your body just doesn’t digest some things as well as others. Fiber is technically carbohydrate calories but our bodies don’t convert it to energy, so they’re there but they don’t contribute to weight gain. I was amazed in the first few months of going vegan that with all of the new delicious recipes and nuts I was eating, I was still losing weight. I’m not a big calorie counter, but I know for certain that I was consuming more calories as a vegan than as a non-vegan but I was still losing weight. Eat for nutrients, not calories. Learn to think of cooking as a something fun to do and not a chore. I love cooking so this was easy for me. Most of us grew up in a world that was made up of highly processed convenience foods so we’re just not used to spending a large percentage of our week cooking or preparing food. The pendulum has got to swing back because the negative health impacts of all the time we’re saving are not worth it. I’ve found that I feel more like a human being when I spend more time preparing food. It made me realize how much I used to feel like a robot. There is something meditative about chopping veggies. Also, if you’re a born hostess like me, you will delight in nothing better than that look of surprise when you make a new recipe and the person trying it says, “Oh good lord, this is fantastic!! !” I know it sounds corny, but people know that you put love into your recipes. It feels really good to cook for others. Know that dishes won’t be so hard to wash. This is a vegan secret. Vegan food just doesn’t stick to pans and plates the way that animal products do. You will have more dishes to wash (sorry I hate to bring this up), but they are a breeze. If you have a dishwasher, you’re all set. Read up on dangers of nasty things that are put in processed foods. That helps me to stay away, although back to number 1, no one will come arrest you if they catch you eating oreos, those horrible little cancer bombs that are accidentally vegan. See my Recommended Books and Cookbooks for my favorite cautionary tale books. I now look at cancer-causing food in a box with disgust and I hear screaming mother cows when I see cheese. Addiction gone. Cook beans! They are so CRAZY cheap! I mean CRAZY cheap! They are so good for you and did I mention that they are CRAZY cheap?! Vegan doesn’t have to be expensive. All you do is soak the beans for a few hours, boil them for an hour in a pot or for a matter of minutes in a pressure cooker and then put some in the fridge and some in the freezer. Buy yourself some extra BPA-free freezer proof containers. I like to store them in the freezer in 1 1/2 cup portions because that’s the size of the standard can which tends to be in recipes. To make things easy when you start, you can buy your beans in the cans, but you’ll know when you hit the point of thinking that a can of beans is too expensive and then get thee to the bulk food bins! A word of warning – the dried beans expand a lot so you don’t want your pot to overflow. I suggest two scoops in the bulk bin to make a large pot full of beans. Beans are a great addition to any healthy diet and they are incredibly inexpensive if you soak and cook your own. Use vegan substitutes only as long as you have to. I rarely use vegan substitutes now. I was raised rarely eating meat and I’ve spent a good portion of my life vegetarian, so this one may have been easier for me than it is for others because I just don’t have a taste for meat. I think that if you get a big bad pizza craving and you think you’re about to fall off the wagon, then by all means go for a Daiya cheese pizza with vegan pepperoni. But, if you think about it, vegan cheese is just cleverly formulated fat. So is vegan cream cheese. I used to have a yogurt every morning so I really needed soy yogurt to keep that habit going as I changed others because I just missed the texture. Remember that you can’t change everything at once, so if you need substitutes in the beginning, go for them. But, these substitutes help us to continue eating the Standard American Diet, which is high is refined carbohydrates and fat. If you’re like me then one of your major reasons (at least initially) to go vegan was your health. You’re going to be a lot healthier eating a chunky veggie bean soup than you are a veggie burger with Daiya cheese and a white bread bun. One thing at a time, though and this is the item that I’ve just recently cut back on after being vegan for over a year. Have fun! Join a Vegan Meetup group in your area and meet some new wonderful people! Let me know if you have any other tips that really helped you if you are vegan, or if you’re not, let me know what some stumbling blocks are that you’ve had.